Louise (Lou) Wandsworth is thirty two years old when she moves back to her home town to clear out her Father’s house ready to sell on after his death. She isn’t married (she hadn’t had a relationship last longer than three months!) and sent her last boyfriend packing when her tried to surprise her. But none of these things particularly matter to Lou. She is still damaged from being groomed as a teenager by her then karate teacher Michael (Mike) Hughes. She knows she shouldn’t look him up, she should leave everything be and try once and for all to move on with her life. Particularly not when she realises that Mike is involved with another teenager, Chloe Meadows. The situation is eerily similar. Both Lou and Chloe were insecure teenagers with few friends and broken, sometimes violent or drunken families. Mike offers a chance to get away from real life, tells them he loves them, that they are beautiful and that he wants to be with them forever. Lou believed him, and knows that she must somehow get to Chloe or stop Mike before history repeats itself. When Mike took Lou to France, he promised her the Earth. She didn’t realise it was abduction until it was too late. She cannot let Chloe be Mike’s latest victim, she must do something. After trying the Police under a false name she realises it’s useless without evidence. The Fear tackles a few very difficult subjects with sensitivity and as for the ending. It’s a fast paced novel, in the sense that you want to keep reading to see where you are being led and as for that ending - well let’s just say it doesn’t disappoint. Another amazing novel from C.L. Taylor. 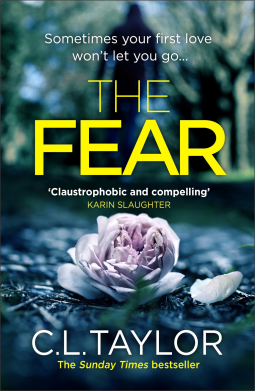 The Fear is available from 22 March 2018.